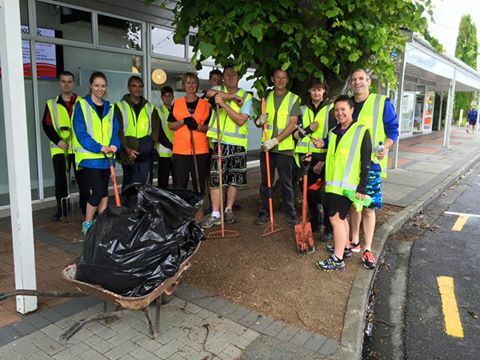 On Saturday 21st November, Lara, Melissa and Paige along with 200 other local volunteers, all got stuck in cleaning up the Papakura town centre. The clean-up day was organised by our wonderful client, Manukau Beautification Charitable Trust (MBCT) which promotes, supports and undertakes programmes, actions and initiatives to beautify Auckland. We had a fun morning dressed in our fluoro vests, carting a wheel barrow and numerous other gardening tools. We got assigned our office carpark and our neighbouring properties… we got a sweat on to say the least and enjoyed a few good laughs! Other volunteers were dispersed throughout the town centre, removing graffiti, painting fences, picking up rubbish and pulling out weeds. A big thanks to all the help of the volunteers and the organising by MBCT, the Papakura town centre was looking spick and span by the afternoon.